Structured processesfor issue reporting and case management. Integrated information and technology architecturefor issue reporting and case management. Issue reporting and case management processes determine the types of information needed, gathered, used, and reported. It is through the integrated information and technology architecture that processes can be properly managed. The architecture defines how organizational processes, information, and technology is structured to make issue reporting and case management effective, efficient, and agile across the organization. Issue reporting and case management processes are a subset of overall business and GRC processes. Issue reporting and case management identifies where things are going wrong with a goal of containing, addressing, and correcting exposure, loss, and incidents. 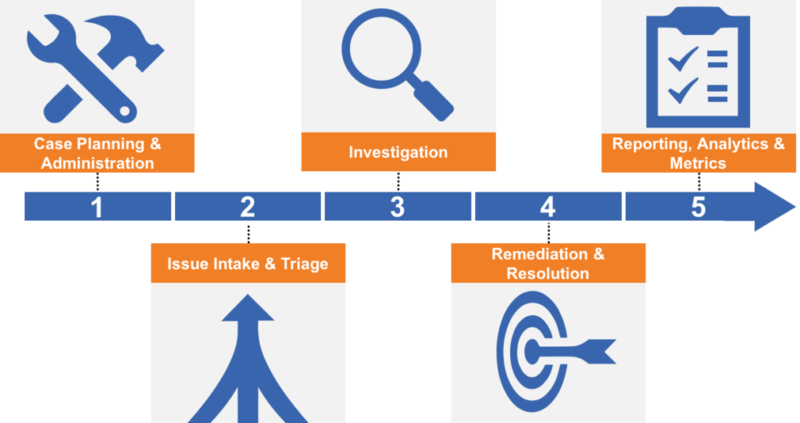 The issue reporting and case management process is the structural design of tasks and management of how issues are reported, investigated, and resolved. Structured processes for issue reporting and case management defines responsibilities, workflow, tasks, how issues are reported, cases managed, and how the processes work together as an integrated whole with other GRC and organizational processes. Issues and cases provide objective information that should in turn feed into risk management models as well as compliance reporting. For a mature GRC program, the organization requires the ability to track all issues across the enterprise (e.g. employee issues, customer issues, poor product quality, and supply chain). Strategic/operational case planning and administration.This involves the ongoing planning and administration of issues, cases, investigators, workload, and tasks. Core to this is resource and case planning and administration, the ability to measure cycles/seasonality of cases, backlog, resource planning, and costs. Issue intake & triage.This is the foundational component where issues are reported. It involves being able to report and process issues coming from hotlines, web forms, management reports, and other inputs. The goal is to eliminate noise, consolidate duplicated issue reports, flesh out non-cases, and focus on what is critical and exposes the organization to the greatest risk. It is critical that the organization has the ability to automate and link between issues being reported, cases, parties, processes, places, and other relationships. From here initial planning and assignment of cases is done. This is the heart of the process that takes reported issue(s) and manages the process of investigation through to closure. Investigators need structured templates and processes to keep everything organized, document the investigation, manage tasks, provide notifications and escalation, and keep all information in one place for ease of reporting. The more the organization can automatically define the process to investigate an issue/case, the better. Accountability, centralization of information, keeping everything current and up to date, and having a defensible system of record that can stand up in court is critical to this stage of the process. Remediation & resolution.History repeats itself because no one was listening the first time. This stage of the issue reporting and case management process ensures that remediation steps are followed to mitigate or eliminate the risk of further issues and incidents. The organization needs to be able to track action items and ensure that things do not slip through cracks to obtain a reduction in repeated and future cases. The organization requires the ability to link issues to policies and procedures to ensure they are updated as resolutions dictate. Reporting, analytics & metrics.This is the stage of the process that provides detailed reports on both individual and aggregate cases. The organization should be able to track past due tasks, benchmark timelines of cases, identify where loss can be mitigated, and reduce gaps. Documents, spreadsheets, and email.Manual spreadsheet and document-centric processes are prone to failure as they bury the organization in mountains of data that is difficult to maintain, aggregate, and report on, consuming valuable resources. The organization ends up spending more time in data management and reconciling as opposed to active risk monitoring. This is where most organizations have focused in managing issues and cases. There is increased inefficiency and ineffectiveness as this document centric and manual approach grows too large and limits the amount of information that can be managed. Custom built databases.Organizations also have built custom internal databases to manage issues and cases. The challenge here is that the organization ends up maintaining a solution that is limited in function and costly to keep current. Many companies go from the document and spreadsheet approach to building a custom database that is limited in features, reporting, and scalability at a cost of internal IT resources and maintenance. Issue reporting and case management platforms.These are solutions deployed for issue reporting and case management and have the broadest array of built-in (versus built-out) features to support the breadth of case management processes. In this context, they take a full-lifecycle view of managing the entire process of issue reporting and case management. These solutions allow an organization to govern incidents and issues throughout the lifecycle and enable enterprise reporting. Most homegrown systems are the result of starting with tools that are readily available and easy: documents, spreadsheets, emails, and desktop databases. Too many organizations take an ad hoc approach to issue reporting and case management by haphazardly using documents, spreadsheets, desktop databases, and emails, which then dictates and limits what their issue reporting and case management process will be limited to. This approach then grows and expands quickly outgrowing these desktop tools to the point where it grows cumbersome. 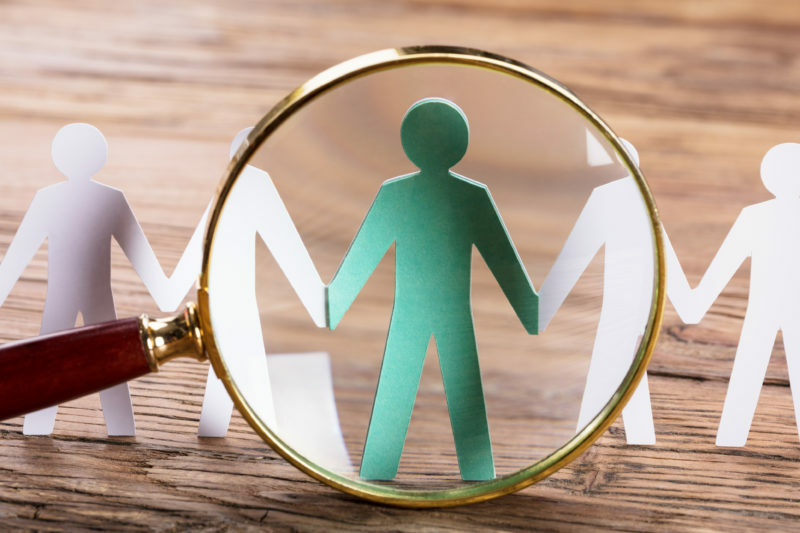 Organizations suffer when they take a myopic view of issue reporting and case management technology that fails to connect all the dots and provide context to analytics, performance, objectives, and strategy in the real-time business operates in. The right issue reporting and case management technology architecture choice for an organization involves an integrated platform to facilitate the correlation of issue and case information, analytics, and reporting. NOTE: GRC 20/20 will be conducting a Research Briefing on how to build a business case, define value/return, and navigate the range of requirements and solutions to automate and enable the issue reporting and case management process. For example, one organization spent 200 FTE hours on doing an end of year report on the organizations cases, investigations, incidents, and issues . . . it now takes them less than 5 minutes. Register to attend (and gain access to the on-demand recording afterwards) Buyer’s Guide: Issue Reporting & Case Management Solutions.